Mbombela conference venues and conference centres including venues for conferences such as Bundu Country Lodge, Buhala Game Lodge, Bushveld Lodge and Chaltes, Ekukhanyeni Christian Retreat, Emnotweni Arena, Emnotweni Sun Hotel, Francolin Loidge, Harmony Guest House, Leaves Luxury Guest Lodge, Malaga Conference and Holiday Resort, Mercure Nelspruit, Ngongoni Private Lodge, Orion Hotel Promenade. Conference Venues South Africa has a comprehensive list of conference centres and venues for conferences in Mbombela. Whether you need a venue for a business meeting, training course, corporate hospitality event or a conference we have the perfect venue for you. 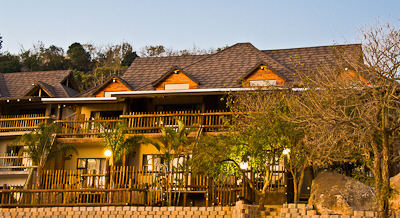 Mercure Nelspruit Conference Venue - Number of rooms .......... 5 Maximum capacity .......... 100. The hotel is located 25 km from the International airport, 5 kilometers from the city..
Nelspruit or Mbombela is the capital city in Mpumalanga located on the Crocodile River. There are many orange farms in the area around Mbombela. It is a leading agricultural and manufacturing hub. Major industries include paper production, the canning of citrus fruit, timber mills and furniture manufacturing.